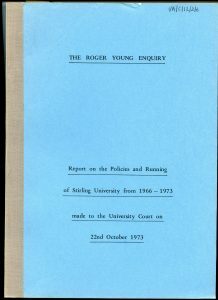 The collection of administrative papers of the University of Stirling held in the University Archives records the development of the University and the significant events which have left their mark on the institution. In 1972 the university was planning for a royal visit. A new vibrant university set in beautiful grounds, Stirling was keen to celebrate its achievements and many staff were involved in the hard work to ensure the visit of Queen Elizabeth II went smoothly. Unfortunately the event did not go to plan. Some students protested during the visit and the subsequent press coverage and public outrage, caused embarrassment to the University. Media reaction to the Queen’s visit to the University of Stirling in October 1972. However the newspaper headlines and photographs only told one side of the story. The extensive photographic record of the visit held in the University Archives shows the reality of the event with cheering crowds of well-wishers outnumbering the student protesters who caught the media’s attention. 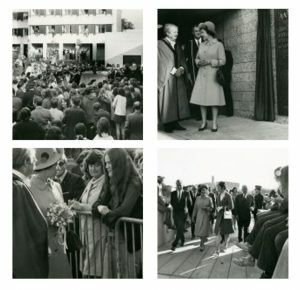 A selection of images of the Queen’s visit to the University of Stirling, October 1972.